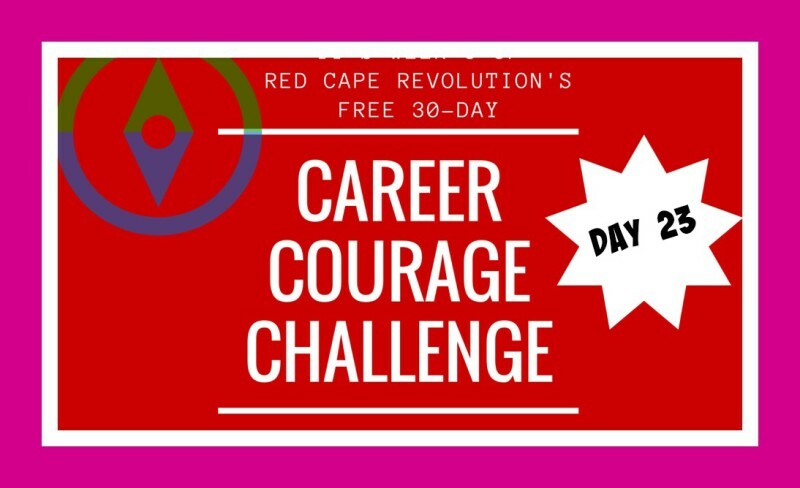 It’s our Day 23 Career Courage Challenge, and we always want to know how they’re working for YOU! Email us or write in the Comments at the end of this article, or on Facebook and LinkedIn, too. I’ve been taking the challenges along with you–read my notes in each day’s Comments. In yesterday’s challenge, you met your career fear. Gave it a name. Looked it in the eye. Today, we need to decide what to do about it. But not everything. Just one thing. What’s the first thing we do when that fear hits? What’s the first action we’ll start training ourselves to take when that fear starts to sneak up on us? When you decide in advance on the action, you take away the power of the fear. You have a tool to use so that the fear doesn’t spiral out of control and stop you from doing the things you want –and need—to do. Because isn’t that why you’ve built career courage, anyway? My action when fear its is to GET OUT! Take a walk, change my physical energy, go to the beach (remembering that I’m lucky enough to live near one). I can get too stuck in my own fears and keep trying to swirl it around in my brain for a solution. My action needs to be just to leave it be, to move, and to change the dynamic so I can get clear again on what’s most important. Hold me to it! What’s yours?